As the football calendar draws to a close and many leagues finish it’s time to squeeze the last few drops out of the wet cloth of the season. Some minor leagues shamble to the finish line like a septuagenarian finishing the marathon, with odd games dotted about until mid may. The Staffs County being among them. 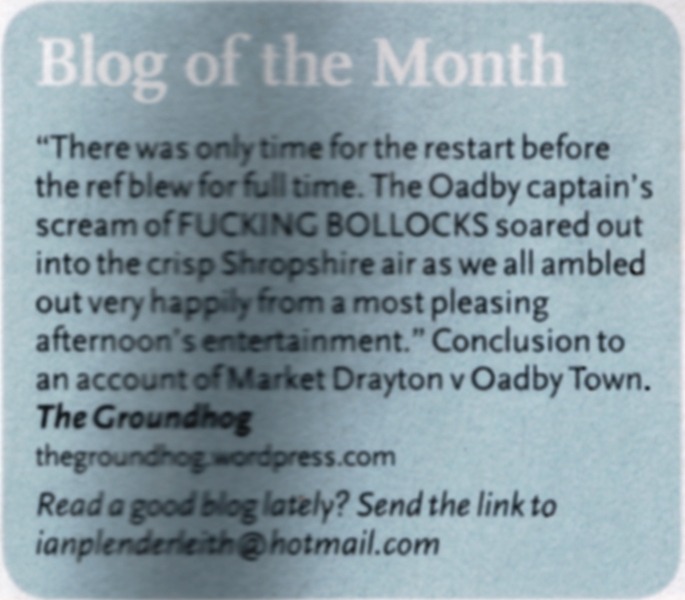 My first outing was opportunistic to say the least, and not one I’m in a hurry to repeat any time soon. My only excuse for watching step eight football on nothing more than a pitch was that it was walking distance from where I live at just 1 1/2 miles. And it was a two hour slot in which I would be otherwise lounging around, staring at the ceiling or picking fluff from my naval. 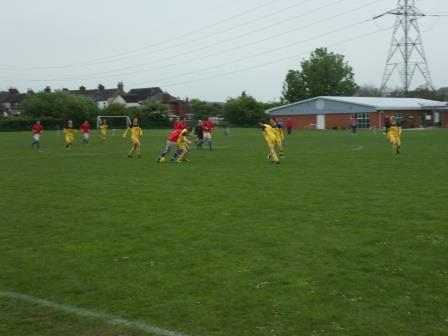 Milton United have a strange history in the Staffs League – when they started they played at their Leek Road ground, which has a lot of character and was still in use last season; by two-season wonders Vodafone Stoke. It’s a very compact ground, hemmed in by trees, schools and housing and with a small stand down one side. Certainly a nicer venue than their current one. 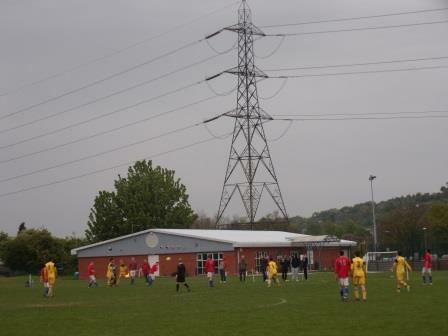 The original Milton United folded but then emerged last season; not at their traditional home but at the Hardman Development Centre about two hundred yards through the village of Milton. With Vodafone Stoke folding, the Leek Road ground is not used by any teams, unfortunately. 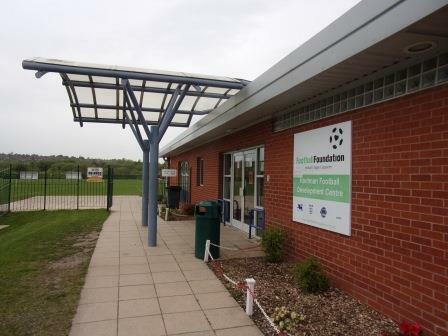 The Hardman Development Centre is a great venue for football in the community with huge clubhouse, ample parking, three full size pitches, a 3G pitch, and three kids’ pitches. It is deceptively vast; given its entrance in a fairly dense pocket of urban-ness, you don’t expect that much space to be sitting there. However, it’s not a great venue for your average ground hopper, being a pitch with dugouts. Only two sides were roped off by plastic poles and thick nylon. It’s location is mixed, next to the Cauldon Canal and old railway track but overlooked by electricity pylons. Nylon and Pylon. As ever at this level, I was frustrated by the action. When other people watch county football they seem to regularly see scorelines such as 5-5, 8-3, 11-2 etc. When I watch county level football, invariably the teams are so inept it’s difficult to imagine either team scoring one goal let alone a hatful. The finishing and passing accuracy just doesn’t lend to high scoring games. As it was with this one. It wasn’t the worst of games but clear cut chances were few. Bradwell (5th in the league, named after the area of Newcastle-under-Lyme, but playing in Crewe) scored a brilliant volley early on and doubled their lead before half time. I was impressed, almost moved, by the uplifting perorations of the young Milton manager at half time. Milton improved palpably in the second half and I was rooting for a comeback. A great half volley halved Bradwell’s lead, and they should’ve equalised minutes later. Two yards out with no goalkeeper the striker skilfully managed to hoik it over the bar. Despite Milton being the better side in the second half, Bradwell got themselves a late penalty, which was fired over the bar at about an angle of 60 degrees. Final score 1-2. This entry was posted in Groundhopping, Non-League, Travelog and tagged bradwell fc, hardman development centre, milton united, non league football, Staffs County Senior League. Bookmark the permalink.